Temperatures popped under Saturday’s bright spring sunshine and so was a Pop Shop Market, which sprang up for a weekend-long visit to historic Town Hall Green. 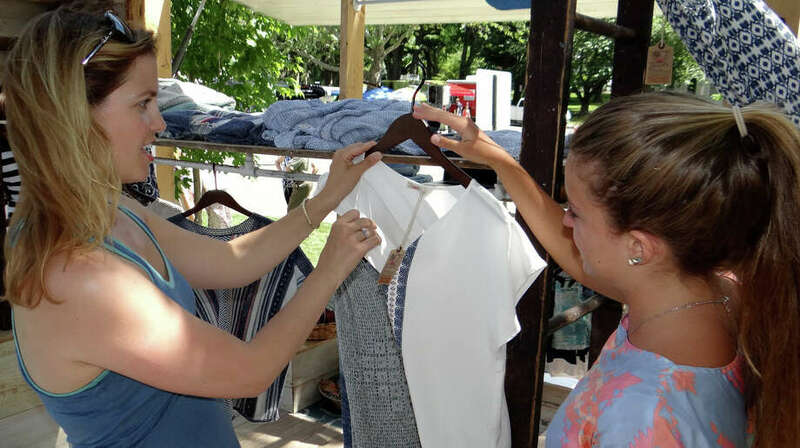 After a busy Saturday, the market was set to open again Sunday from 10 a.m. to 3 p.m.
A wide range of merchandise was on offer from clothing of all sorts, crafts, home furnishings and housewares and garden supplies, as well as food and drink. The market, founded by Andrea Espach and Ashley Kane, was produced this time around in collaboration with the Fairfield Chamber of Commerce, led by Executive Director Beverly Balaz. Visit www.popshopmarket.com for more information.